His education initially develops learning by his father Giordano and then he keeps on studying with the well-known pianist Glauco Venier. He studies for two years with the drummer-percussionist Roberto Dani, with whom he enhances the rhythmic aspects of jazz. 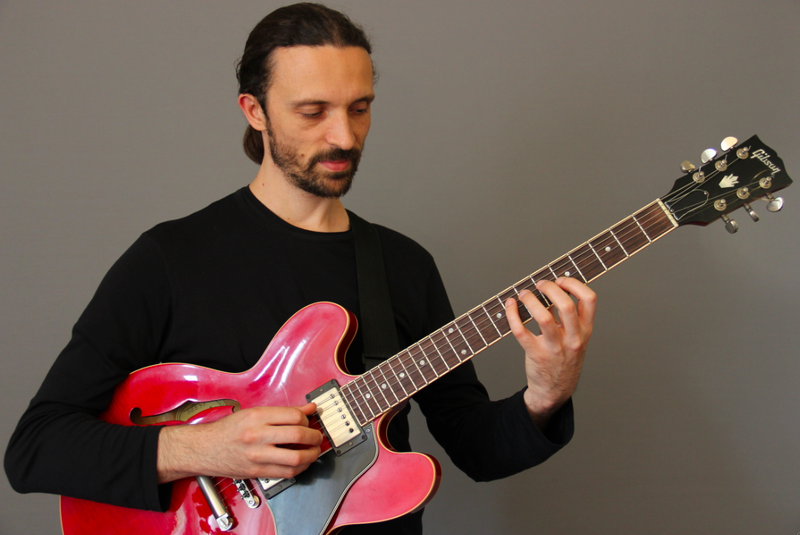 He graduated at I-level jazz degree with 110/110 and eulogy at Trieste Conservatory “G.Tartini” Jazz School where he studied with Pietro Tonolo, Marcello Tonolo, Attilio Zanchi, Cinzia Gizzi, Ennio Guerrato, Stefano Procaccioli, Claudio Sessa and Venier himself. He graduated at II-level jazz degree at the same conservatory with 110/110. Representing Trieste Conservatory, he participates to the “European Jazz Project”, project that unites the best students of the most important european academies, playing live at “Jazzhead 2006” and “Jazzhead 2007” International festivals, orchestra directed by Michael Gibbs in Bremen (G). He takes part to the recordings of the CD “SEASONS” (1999), music by Glauco Venier arranged for the orchestra by Valter Sivilotti. He collaborates with many well-known musicians of the italian and International jazz scene: G. Venier, K. Gesing, M. France, C. Laurence, E. Vloeimans, P. Tonolo, N. Le, Y. Goloubev, J. Pukl, R. Lopatic, M. Loborec, D. Cecchini, P. Birro, R. Emili, A. Kramer, R. Dani, S. Majore, D. Boato, M. Alulli, R. Bonnisolo, U.T. Ghandi, F. Sotgiu, D. Memoli, M. Chiarella, M. Tonolo, M. Raja, A. Succi, N. Fazzini, S. Senni, T. Cappellato, M. Abrams and others. He composes, with Roberto Franceschini, the music for the comedy “KM 99” of the Friulian author C.Mezzelani. In 1998 founds the trio COLUSSI-FRANCESCHINI-CHIARION together with double-bassist R. Franceschini and drummer-percussionist L. Colussi. This trio records for A.U.A. Records the CD entitled “COLUSSI-FRANCESCHINI-CHIARION” (2000) playing original tracks. With the same band is finalist at the International contest “Viva il Jazz” (Milan). He played venues at several festivals such as: ”Padova Porche Jazz Festival 2007″, “Crocevia di Suoni 2007” (Agrate Brianza – MI), “Siena Jazz 2007”, “Siena Jazz 2006″, “International October Festival of Jazz 2003 – 2005″ (Kragujevac – Yu), “Garda Jazz Festival 2003″, “Cartellone Jazz” Teatro Eden (Treviso), “Lignano Jazz”, “Gorizia Jazz”, “Udine Jazz”, “Jazz And Wine 2005″, “FolkEst2005″, “Jazzahead” (Brema – D) and others. He is one of the “Big Band of Friuli-Venezia Giulia” founding members, directed by Venier, and in which take part some of the best musicians from Friuli-Venezia Giulia and Veneto jazz environment. In 2004, after the winning of the National Prize of the Arts organized by M.I.U.R., he takes part to the recordings of the winning-artists CD with four unreleased tracks. In 2005 he records the CD with original music “Sestante” (2005) with the group Namòs featuring Pietro Tonolo at sax. In the same year he takes part to the recording of the CD “Tracce” (2005) with music by Palo Patui and Fabrizio Fabris arranged by Glauco Venier. At the beginning of 2006 joins in in Pietro Tonolo quartet playing with Marc Abrams and Tommaso Cappellato and playing in Capodistria, Trieste, Siena Jazz and other places. From January 2007 he starts playing in “Thelonious Monk Big Band” directed by Marcello Tonolo and he plays live in many theaters. With the same band he records a soon-to-be-released CD dedicated to G.Parise. In March 2007, at Bremen JazzXchange festival, he plays in the International big band composed of some of the best musicians coming from Sweden, Finland, Norway, Belgium, Germany, Hungary and Italy and directed by composer Michael Gibbs. He plays with Nicola Fazzini Quartet, along with Stefano Senni and Tommaso Cappellato. This lineup recorded the CDs “Watch your Step” (2008) and “Metamorfosi” (2013) with Luca Colussi at drums. He records the CD with the singer Federica Santi entitled “Decantando” (2008) with Yuri Goloubev, Nicola Bottos and Luca Colussi at drums. He plays in the CD “Bricolage” (2008), of saxophonist Mauro Darpin, along with Alessandro Turchet at doublebass and Luca Colussi at drums. Among the last works is relevant the participation to G.Venier’s project “Tribute to Frank Zappa” with international-wide known musicians: Martin France, Klaus Gesing, Chris Laurence, Eric Vloeimans, Pietro Tonolo, Dario Cecchini, Rossano Emili, Marcello Allulli, Yuri Goloubev, Mirko Cisilino, Federica Santi, Luca Colussi, Alberto Vianello, Gabriele Rampogna, which in 2008 culminates with the CD “Glauco Venier Suona Frank Zappa”. In 2009 he founds a new quartet with Michele Polga at sax, Stefano Senni at double-bass and Luca Colussi at drums playing original tracks and performing at Gorizia Ermi Bombi Jazz Festival (2009); with this lineup records the first CD entirely in his name: “Sirene”. In 2010 he plays with Kenny Wheeler performing a still unreleased new suite with John Taylor, Diana Torto, Achille Succi, Fabio Petretti, Rossano Emili, Gianpiero Lo Bello, Flavio Davanzo, Roberto Rossi, Paolo Ghetti, Stefano Paolini and Francesco Sotgiu, director Michele Corcella. He plays in the CD “Camarones a la plancia” (2012) of young double-bassist Rosa Brunello, together with David Boato, Piero Bittolo Bon, Luca Colussi. Guests are Filippo Vignato at trombone and Glauco Venier at piano. In 2012 he records “Mosaico”, CD of original tracks recorded in quartet with Alessandro Turchet, Luca Colussi and guest Pietro Tonolo at sax. In 2014 he records a new CD of original tracks with John Taylor at piano, Diana Torto on vocals, Julian Siegel at sax, Alessandro Turchet at double-bass and Luca Colussi at drums, "Waves" (Caligola Records 2015). “Premio Nazionale delle Arti 2006″ organized by MIUR finalist, for the category Jazz ensemble music. “Premio Nazionale delle Arti – Edizione 2005 Targa Paul H. Jeffrey” winner organized by MIUR, for the category jazz ensemble music. “Premio Nazionale delle Arti – Edizione 2004″ contest winner organized by MIUR, for the category Jazz ensemble music. XVII Edition of the Prize “Lilian Caraian” per la Musica 2002 – «Jazz per organici vari dal Duo alla Big Band» – participation at the final performance in trio (Chiarion, Darpin, Bernetti) and merit certificate as guitarist. “Viva il Jazz 2001” – Internazionale Contest for Jazz Groups – finalist with the lineup Colussi, Franceschini, Chiarion. He is jazz guitar teacher at Trieste “Giuseppe Tartini” Conservatory. Since 2006 he is Gorizia Jazz Workshop artistic Director, a seminary dedicated to the in-depth execution of jazz music organized by Musica Libera of Gorizia Cultural Association. In the same Seminary he is jazz guitar and Jazz ensemble music teacher. GypsyJazz Students feel immense pleasure in reading the biography of such a great person. We all are a great fan of yours and your music. I congratulate you on winning such top competitions and moreover by earning such a great name in the realm of Jazz Music.